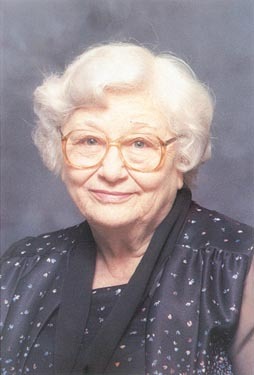 Thelma Lee (Lummus) Wright is the oldest of four children born to the late Andrew Jackson and Laura Francis (Warren) Lummus, and the sister of 1st Lt. Jack Lummus, in whose name she--together with Hadgie Sue (Lummus) Merritt--will christen the fourth and newest Maritime Prepositioning Ship on February 22, 1986. Thelma was born in Ellis County Texas, and reared in Ellis County in Alma and Ennis. She graduated Alma High School, where she was active in athletics in basketball and tennis. She was employed at Ennis Tag and Sales Book Co. (now Ennis Business Forms, Inc.), and, for many years, owned and operated Wright's Record and Gift Shop in Ennis. On September 5, 1931 Thelma married Thomas Gilbert Wright of Alma. She gave birth to a son, Pete, and a daughter, Jacklyn, who she named after Jack and his fiancée, Ethlyn "Skipper" Bookwalter. Like Jack, Gilbert served in the U.S. Marine Corps during World War II. Thelma has two granddaughters, Fanny and Mandy. She continues to be an enthusiastic sports fan, and is an avid reader. She is an active member of the Gilmer-Baldridge Church of Christ in Ennis. She is prominent in the activities of the Ladies Auxiliary of the Veterans of Foreign Wars Post 7106, which was named in honor of 1st Lt. Jack Lummus on January 8, 1982.